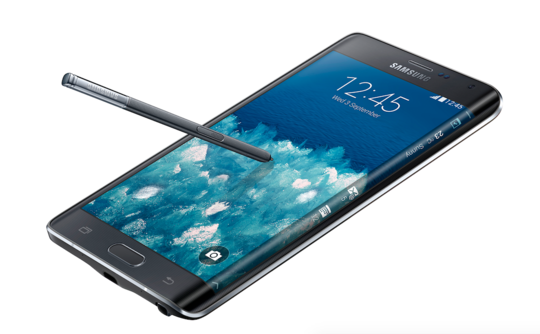 If the regular Note 4 just isn't weird enough for you, there's always the Galaxy Note Edge, which is about to make its US debut on AT&T and Sprint. In addition to the flat touchscreen surface we've all become accustomed to, the Note Edge has an extra column of screen that wraps around the right edge of the device. Is it a good idea? Questionable, but it's at least interesting. AT&T will have the device online and in select stores on November 7th where you'll be able to buy it on a 2-year contract for $399.99, which is crazy. The NEXT monthly pricing is $39.42 for 18 months or $47.30 for 12 months. The off contract price is $945.99. Sprint will have the phone the following week on the 14th for a more reasonable $35 for 24 months, or $840 total. Like the traditional Note, the Edge has an S Pen and a rather large screen. It's 5.6-inches with a resolution of 2560x1440+160, with that extra 160 being the width of the wraparound bar on the right. It can display shortcuts, notifications, and news without interrupting what's going on elsewhere on the screen. It that worth the cost? It's up to you. Update: It looks like T-Mobile, Verizon Wireless, and U.S. Cellular will carry the Note Edge too, but pricing is unknown right now. T-Mobile will have it on November 14th for $36.25 per month for 24 months ($870 total).